How do you define trauma? It isn’t just car crashes, natural disasters, or unexpected loss of a loved one. Actually, trauma can be experienced when we are bullied, go through divorce, or have an embarrassing moment in our childhoods. The beliefs we hold onto around these traumas can affect us years later, and in some cases, a lifetime if we allow them to. There is hope and healing in EMDR, a therapeutic and empirically researched treatment that helps re-wire your brain and change your ... See More negative beliefs and your body’s physiological response to the memories of the trauma. 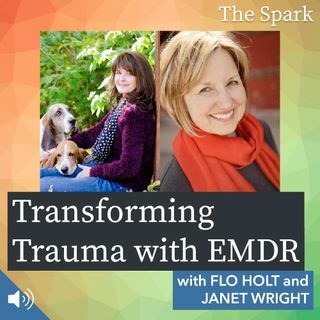 Join me for an enlightening and important interview with trauma specialists Flo Holt and Janet Wright as we delve into the dark places that can define us to the liberating light that can be illuminated through the experience of rewiring trauma in the brain and reclaiming our lives.